Desert rose plant is so easy to care for, it's a wonder why we don't see these beautiful succulents more often in nurseries and florist's shops. 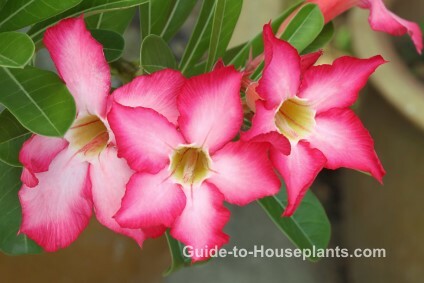 Desert rose branches naturally, creating an attractive treelike house plant. 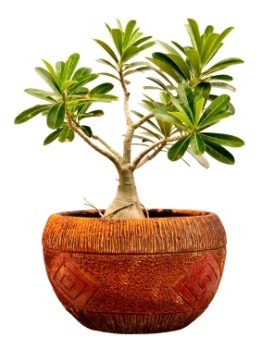 Its succulent stems are covered top to bottom with long, evergreen leaves. 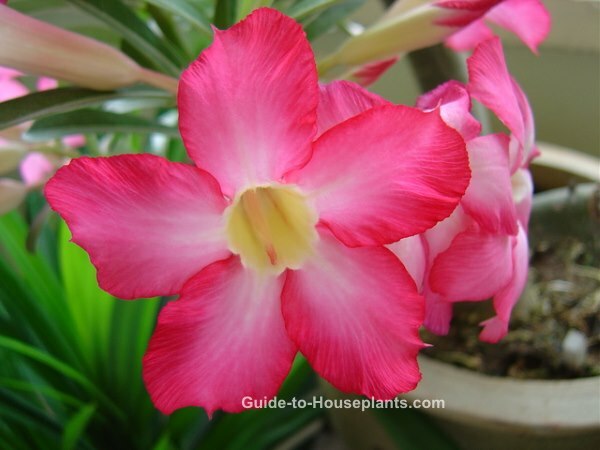 The desert rose flower is a sight to behold, and you'll enjoy them in abundance each summer. Clusters of gorgeous pink or red flowers grow at the tips of the stems, with a succession of blooms that last for months. Put this desert beauty in a sunny window year-round and pot it in a sandy, well-draining mix (cactus potting mix is ideal). It doesn't take much attention to keep desert rose plant happy and blooming. Drought-tolerant, this is one of the easiest succulents to grow, and one of the showiest, too. Water with care. 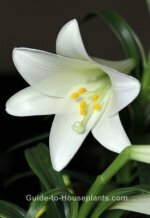 This flowering succulent stores water in its swollen base, so it doesn't need watered often. In fact, it will not tolerate overwatering. Take care to water the potting medium only. 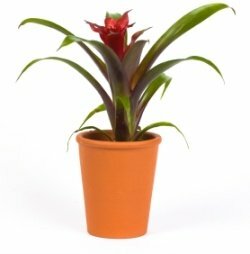 Don't get water on the base of the plant because it will rot and may not recover. Shed some light. Give your desert rose as much light as you can. You can move it out to the patio for the summer, if you want. It can take the summer sun and heat. Just be sure to bring it in before the temperature drops to 50°F/10°C. Dropped leaves. This South-African succulent shrub may drop its leaves and go dormant in the winter. Lack of light, dry soil or cold temperatures will often cause dormancy. Don't worry -- it'll regrow leaves when it gets what it wants. Don't overpot. It flowers best when slightly pot-bound. It's slow-growing and rarely needs repotted anyway. Use a pot with drainage holes to prevent soggy potting medium. Handle desert rose with care -- its sap is toxic. Keep it away from children and pets. Many beautiful hybrids are available to choose from. 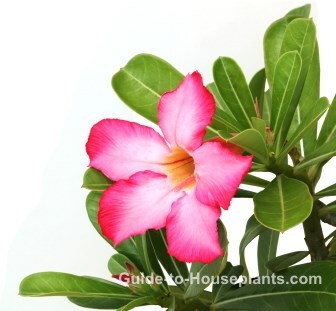 Desert rose flowers range from soft pink to deep red, purple or white, or a variety of combinations. Light: Bright light to direct sunlight. Humidity: Average room humidity (around 40-50% relative humidity). Temperature: Average room temperatures 60-75°F/16-24°C. If you put your plant outdoors for the summer, don't worry -- it can take the heat. Bring it back indoors when nighttime temperatures drop in autumn; it will tolerate a low of 50°F/10°C. Soil: Fast-draining mix, such as cactus potting mix. Or mix equal parts peat moss and sharp sand. Fertilizer: Feed monthly spring through fall with a balanced liquid fertilizer diluted by half.